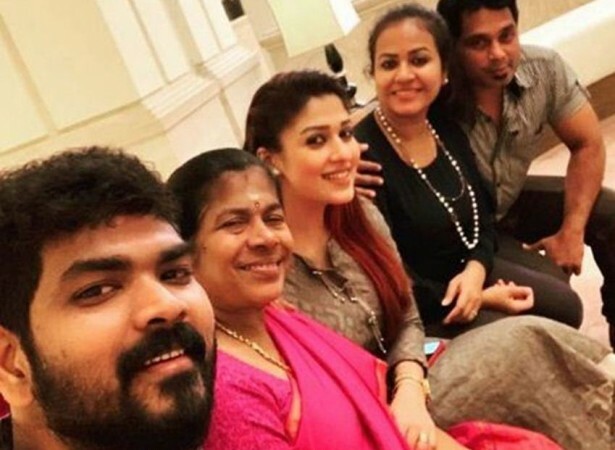 Nayanthara and Vignesh Shivan celebrate Puthandu and Vishu along with family members. A photo shared by Vignesh triggers marriage rumours. Vignesh Shivan and Nayanthara might have been born and brought up in different states, but it does not stop them from celebrating different cultures. Here is one more example where the couple has welcomed Puthandu and Vishu, which are celebrated as New Year by the people of Tamil Nadu and Kerala, respectively. The filmmaker opened up about the celebration on his Instagram account. Apart from his mother, Nayanthara's sister and her husband were apparently part of the festival. "Tamil new year & Vishu wishes to everyone :)) Family is everything #mother #sister #in-laws #kaadhal #love #Kudumbam #lifeisallaboutbalance #lifeisallpositive. [sic]" he captioned the picture. In a matter of one hour, the photo got over 50,000 likes and hundreds of comments. The majority of people commented about Nayan holding the hand of Vignesh Shivan's mother. However, people have bombarded him with questions of his marriage plans as they want the couple to tie the knot soon. Nayanthara fell in love with director Vignesh Shivan after meeting him on the sets of Naanum Rowdy Dhaan in 2015. Currently, they are in a live-in relationship. Of late, it has been reported that the couple had got engaged. The mention of 'fiancé' by the actress at an event indicated that she is engaged to Vignesh Shivan. A ring was spotted on her ring finger. On the professional front, Nayanthara is working on Rajinikanth's next movie Darbar, directed by AR Murugadoss. She was recently part of the shooting of Vijay's upcoming film, presently referred to as Thalapathy 63. Chiranjeevi-starrer Sye Raa Narasimha Reddy, Sivakarthikeyan's Mr Local and Malayalam film Love Action Drama are some of her upcoming flicks. On the other hand, there are rumours that Vignesh Shivan might direct a comedy film starring Rajinikanth.